The pH of a reef aquarium significantly impacts the health and welfare of the organisms calling it home. Unfortunately, many factors tend to pull the pH out of the optimal range of many organisms commonly kept in marine aquaria. Excessively low pH, for example, makes it harder for calcifying organisms to deposit calcium carbonate skeletons. At a low enough pH, the skeletons will actually begin to dissolve. Consequently, it is a parameter that aquarists need to monitor. Monitoring is often only the start of pH issues, however. Many reef aquarists find low pH among the most vexing problems in maintaining appropriate water conditions. This article details why pH may be low in many aquaria, and then details the best ways to raise it. For those with high pH concerns, I have briefly addressed those in a previous article. This section should help aquarists understand what the term "pH" means. Those who want only to understand and solve a low pH problem can just skip down to the bold sentences at the end of this section. where aH is the "activity" of hydrogen ions (H+; also called protons) in the solution. Activity is the way that chemists measure "free" concentrations, and so pH is simply a measure of the hydrogen ions in solution. Hydrogen ions in seawater are partly free (not really free but attached only to water molecules in complexes such as H3O+) and partly complexed to other ions. This effect is why chemists use activity instead of concentration. In particular, H+ ions in normal seawater are present as free H+ ions (about 73% of the total), as H+/SO4-- ion pairs (about 25% of the total H+), and as H+/F- ion pairs (a small fraction of the total H+). These activity issues also impact calibration buffers, and that is part of the reason that different pH scales and calibration buffers are sometimes used in seawater. These other standards need not concern aquarists: all data reported by reef aquarists employ the standard NBS system. where gH is simply a constant (the activity coefficient) that we can ignore for most purposes (for those interested, gH = 1 in pure fresh water and ~0.72 in seawater). In a sense, all that most aquarists need to know is that pH is a measure of the hydrogen ions in solution, and that the scale is logarithmic. That is, at pH 6 there is 10 times as much H+ as at pH 7, and that at pH 6 there is 100 times as much H+ as at pH 8. Consequently, a small change in pH can mean a big change in the concentration of H+ in the water. There are several reasons why aquarists would want to monitor pH in marine aquaria. One is that aquatic organisms thrive only within a particular pH range. This range certainly varies from organism to organism, and it is not easy to justify a claim that any particular range is "optimal" for an aquarium with many species. Even natural seawater (pH = 8.0 to 8.3) isn't going to be optimal for every creature living in it, but it was recognized more than eighty years ago that moving away from the pH of natural seawater (down to pH 7.3, for example) is stressful to fish.1 We now have additional information about optimal pH ranges for many organisms, but the data are woefully inadequate to allow aquarists to optimize pH for most organisms in which they are interested.2-6 Additionally, the effect of pH on organisms can be direct, or indirect. For example, the toxicity of metals such as copper and nickel is known to depend on pH for some of the organisms present in our tanks (such as mysids and amphipods).7 Consequently, the ranges of pH that are acceptable in one aquarium may be different from other aquaria, even for the same organisms. Nevertheless, there are some fundamental processes taking place in many marine organisms that are substantially impacted by changes in pH. One of these is calcification, and it is known that calcification in corals depends on pH, and calcification falls as pH falls.8-9 Using these types of facts, along with the integrated experience of many hobbyists, we can develop some guidelines about what is an acceptable pH range for reef tanks, and what values are pushing the limits of acceptability. That the alkalinity is at least 2.5 meq/L, and preferably higher at the lower end of this pH range. This statement is based partly on the fact that many reef aquaria operate quite effectively in the pH 7.8 to 8.0 range, but that most of the best examples of these types of tanks incorporate calcium carbonate/carbon dioxide reactors that, while tending to lower the pH, keep the carbonate alkalinity fairly high (at or above 3 meq/L.). In this case, any problems associated with calcification at these lower pH values may be offset by the higher alkalinity. Low pH primarily stresses calcifying organisms by making it harder for them to obtain sufficient carbonate to deposit skeletons. Raising the alkalinity mitigates this difficulty for reasons that are detailed later in this article. That the calcium level is at least 400 ppm. Calcification becomes more difficult as the pH is lowered, and it also becomes more difficult as the calcium level is lowered. It would not be desirable to push all of the extremes of pH, alkalinity, and calcium at the same time. So if the pH is on the low side and cannot be easily changed (such as in an aquarium with a CaCO3/CO2 reactor), at least make sure that the calcium level is acceptable (~400-450 ppm). Likewise, one of the problems at higher pH (above 8.2, but getting progressively more problematic with each incremental rise) is the abiotic precipitation of calcium carbonate, resulting in a drop in calcium and alkalinity, and the clogging of heaters and pump impellers. If the aquarium pH is 8.4 or higher (as often happens in a tank using limewater), then it is especially important that both the calcium and alkalinity levels are suitably maintained (that is, neither too low, inhibiting biological calcification, nor too high, causing excessive abiotic precipitation on equipment). The pH of marine aquarium water is intimately tied to the amount of carbon dioxide dissolved in the water. It is also tied to the alkalinity. In fact, if water is fully aerated (that is, it is in full equilibrium with normal air) then the pH is exactly determined by the carbonate alkalinity The higher the alkalinity, the higher the pH. 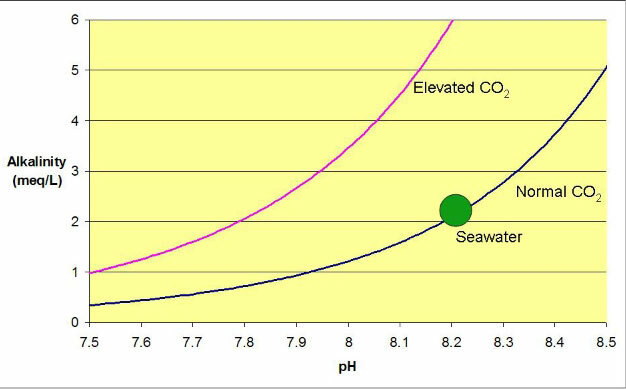 Figure 1 shows this relationship for seawater equilibrated with normal air (350 ppm carbon dioxide), and equilibrated with air having extra carbon dioxide as might be present in a home (1000 ppm). Clearly, the pH is lower at any given alkalinity when the carbon dioxide is raised. 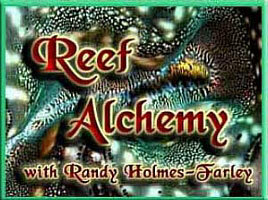 It is this excess carbon dioxide that leads to most low pH problems for reef aquarists. Figure 1. The relationship between alkalinity and pH for seawater equilibrated with air containing normal and elevated carbon dioxide levels. The green dot shows natural seawater equilibrated with normal air, and the curves reflect the result that would be obtained if the alkalinity were artificially raised or lowered. The amount of H2CO3 in the water (when fully aerated) is not dependent on pH, but only on the amount of carbon dioxide in the air (and somewhat on other factors, such as temperature and salinity). For systems not at equilibrium with the air around them, which includes many reef aquaria, the aquarium can be thought of "as if" it were in equilibrium with a certain amount of CO2 in the air, which is effectively defined by the amount of H2CO3 in the water. Consequently, if an aquarium (or the air it is being equilibrated with) has "excess CO2" in it, that means that it has excess H2CO3. This excess H2CO3, in turn, means the pH will fall, as shown below. Equation 4 shows that if an aquarium has excess H2CO3, some if it dissociates (breaks apart) into more H+, HCO3-, and CO3--. Consequently, because of this extra H+, the pH will be lower than if there were less CO2/H2CO3 in it. If seawater has a huge excess of CO2, the pH can be as low as pH 4-6. Equilibrating my aquarium water with carbon dioxide at 1 atmosphere resulted in a pH of 5.0, although that low a value would be unlikely to be attained in a reef aquarium as the substrate and coral skeletons would buffer it as they dissolved. My aquarium water in equilibrium with 1 atmosphere of carbon dioxide and excess solid aragonite (a crystalline form of calcium carbonate that is the same form present in coral skeletons) resulted in a pH of 5.8. Aerating the water with "normal air," driving out the excess carbon dioxide, will move the aquarium parameters along the green line of Figure 3, raising pH to just over pH 8.3. This effect is also what would happen if the growth of macroalgae were used to absorb some of the excess carbon dioxide, although it is rare for that effect to be able to move it all the way along the green line to above pH 8.3. 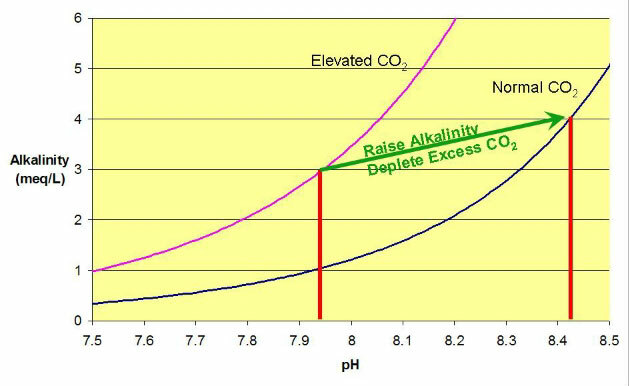 Raising the alkalinity, even if it still has the "excess CO2" in it, will raise pH by moving the aquarium parameters along the green line in Figure 4, to a pH of about 8.1 at an alkalinity of 4.5 meq/L (12.6 dKH). 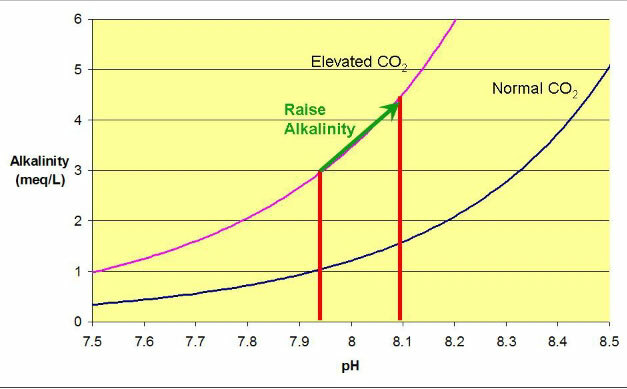 Using limewater (kalkwasser) to deplete the excess CO2 (to normal levels), and also to raise the alkalinity (to 4 meq/L) could move the curve along the green line in Figure 5, resulting in a pH over 8.4 and an alkalinity of 4 meq/L (11.2 dKH). Figure 2. The same curves as in Figure 1, with red bars showing the pH that results at an alkalinity of 3 meq/L (8.4 dKH). The pH is clearly much higher at normal carbon dioxide levels than with elevated carbon dioxide. Figure 3. 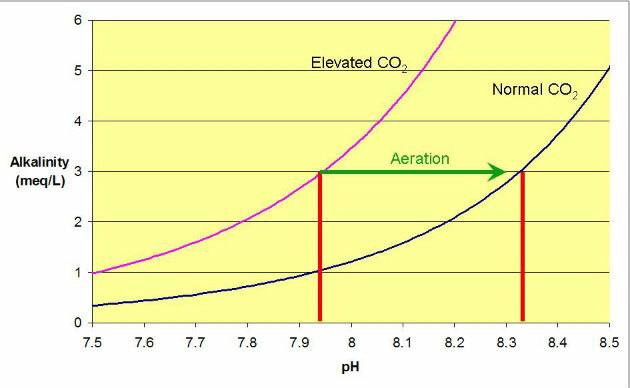 The same curves as in Figure 1 showing the effect of aeration on pH when starting with excess carbon dioxide. Figure 4. 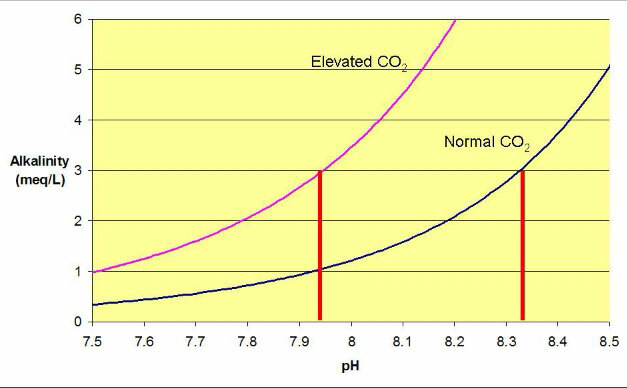 The same curves as in Figure 1 showing the effect of increased alkalinity on pH when leaving the excess carbon dioxide unchanged. Figure 5. The same curves as in Figure 1 showing the effect of limewater (kalkwasser) on pH by both reducing the excess carbon dioxide (the hydroxide combines with it to form bicarbonate and carbonate) and increasing the alkalinity. Why Does pH Change During the Day and Night? So there is net consumption of carbon dioxide during the day. This net consumption leads to many aquaria becoming deficient in CO2 during the day, and the pH rises. This process is happening all of the time in reef aquaria, and it tends to reduce the pH due to the carbon dioxide produced. The net effect of these processes is that pH rises during the day and drops at night in most reef aquaria. This change varies from less than a tenth of a pH unit, to more than 0.5 pH units in typical aquaria. As is discussed in other parts of this article, complete aeration of the aquarium water to drive out excess carbon dioxide, or pull in excess carbon dioxide when deficient, will prevent the diurnal ph swing entirely. In practice that is often not attained, and there is a pH change between day and night. In addition to aeration, the amount of chemical buffering in the water will impact the magnitude of the pH swing. Higher carbonate alkalinity leads to a smaller pH swing as the combination of carbonate and bicarbonate buffer against pH changes. Boric acid and borate also buffer against pH changes. Both of these buffer systems have more capacity at high pH (8.5) than at low pH (7.8), so aquarists with lower pH may see a larger pH swing for that reason alone. I have detailed all of these buffering effects and concerns about the diurnal pH swing in a previous article. A pH calibration or verification fluid using grocery store borax. Try to determine why there is a pH problem before enacting a band-aid solution. For example, if the problem is low pH due to excess carbon dioxide in the home's air, then more aeration with that same air may be of no benefit with respect to pH. Changing the root of the problem may be a much more satisfactory solution. As described above, low pH problems are those where the pH is below about 7.8. That is, where the daily pH low drops below 7.8 for any portion of the day. Of course, if the pH reaches a low value of pH 7.9, aquarists may still want to raise it, but the need is not so immediate. Several things can commonly result in low pH, and the solution to each of them is different. Finally, there's nothing to prevent a tank from having all of these problems simultaneously! The aquarium has low alkalinity. The aquarium has more CO2 in it than the surrounding air due to inadequate aeration. Don't be fooled into thinking that an aquarium must have adequate aeration because its water is very turbulent. Equilibrating carbon dioxide is MUCH harder than simply providing adequate oxygen. There would be NO change in the pH between day and night if equilibration of carbon dioxide were perfect. Since most aquaria have lower pH during the night, they also are demonstrating less than complete aeration. The aquarium has excess CO2 in it because the air in the home that it is being equilibrated with contains excess CO2. The aquarium is still cycling, and has excess acid being produced from the nitrogen cycle and degradation of organics to CO2. Some of the possibilities listed above require some effort to diagnose. Problems 3 and 4 are quite common, and here is a way to distinguish them. Remove a cup of tank water and measure the pH. Then aerate it for an hour with an airstone using outside air. The pH should rise if the pH is unusually low for the measured alkalinity, as in Figure 3 (if it does not rise, most likely one of the measurements (pH or alkalinity) is in error). Then repeat the same experiment on a new cup of water using inside air. If the pH rises there too, then the aquarium pH will rise with more aeration because it is only the aquarium that contains excess carbon dioxide. If the pH does not rise inside (or rises very little), then the inside air contains excess CO2, and more aeration with that same air will not solve the low pH problem (although aeration with fresher air should). Some solutions to pH problems are peculiar to each cause, and these are detailed below. There are, however, some general solutions that are frequently effective. These include using high pH additives when alkalinity is required. Limewater (kalkwasser) is the best choice in this regard, followed by the high pH two-part additives. These methods have the advantage of raising pH, but not raising alkalinity relative to calcium in an undesirable fashion. Buffers alone are not generally a good method as they raise pH little, and result in excessive alkalinity. Unfortunately, the labels on many commercial buffers are written in ways that convince aquarists that the pH will be fine if they just add some buffer. More often than not, the pH is not improved for more than a day, and the alkalinity rises beyond desired limits. Two other useful methods include growing macroalgae that absorb some CO2 from the water as they grow (often lit on a reverse light cycle to the main tank to provide the maximum pH rise when the main tank is at its pH minimum), and aerating the water with fresh air. A common cause of low pH in a reef tank is the use of a calcium carbonate/carbon dioxide reactor. These reactors use acidic carbon dioxide to dissolve calcium carbonate, and the effect is to deliver a substantial, but transient, amount of acid to the tank. Ideally, the carbon dioxide is blown back out of the tank after it has been used to dissolve the CaCO3. In reality, however, this process does not go to completion, and aquaria using CaCO3/CO2 reactors typically run at the low pH end of the spectrum. The solutions that follow assume that the reactor is properly adjusted. A maladjusted reactor can drive the pH down even lower than usual, and in that case, proper adjustment is the first step. How to set the various parameters of a reactor is beyond the scope of this article, but from this standpoint, the pH or the alkalinity of the effluent must not be too low. Many approaches have been suggested, with varying success, to minimize the low pH problem encountered with CaCO3/CO2 reactors. One is to use a two-stage reactor that passes the fluid through a second chamber of CaCO3 before releasing it into the tank. Dissolving additional CaCO3 has the effect of raising the pH, and also raising both the calcium and alkalinity levels in the effluent. This approach seems to be successful at raising the pH of the effluent, but it cannot raise it all the way to the tank's pH, so the low pH problem does not completely disappear. Another approach is to aerate the effluent before it is delivered to the tank. In this case, the goal is to blow off the excess CO2 before it gets to the tank. This approach can work in theory, but typically does not in practice because not enough degassing time is permitted before the effluent enters the tank. Another concern with this approach is that if it really were successful at raising the pH, the supersaturation of CaCO3 in the effluent might rise high enough to cause reprecipitation of CaCO3 in the reactor, fouling it and reducing its effectiveness. A final approach, and probably the most successful, is to combine the CaCO3/CO2 reactor with another alkalinity supplementation scheme that raises pH. The most useful method in this application is limewater. In this situation, the limewater is not being used to provide large amounts of calcium or alkalinity, but to soak up some of the excess CO2, and thereby raise the pH. The amount of limewater needed is not as large as for full maintenance of calcium and alkalinity. The limewater addition can also be put on a timer to add it only at night and early morning when the daily pH lows are most likely to be problematic. The limewater addition could also be on a pH controller, so that it is added only when the pH gets unusually low (such as below pH 7.8 or so). High indoor carbon dioxide levels can also lead to low pH problems in many tanks. Respiration by people and pets, the use of un-vented appliances burning natural gas (e.g., ovens and stoves) and the use of CaCO3/CO2 reactors can lead to high indoor carbon dioxide levels. The level of carbon dioxide can easily be more than twice that of exterior air, and this excess can substantially lower the pH. This problem is especially severe in newer, more airtight homes. It is unlikely to be a problem in homes like mine where the wind can be felt blowing around old window frames. Many aquarists have found that opening a window near the tank can significantly raise the pH within a day or two. Unfortunately, those aquarists living in colder climates cannot comfortably open windows in the winter. Some have found it useful in these situations to run a pipe or tubing from the outside to the air input of a skimmer, where fresh, exterior air is rapidly mixed with the tank water. Be advised, though, that if the aquarist happens to live in an area where insecticides are periodically sprayed for mosquito control (such as in many metropolitan areas of the South), it is important to place some type of carbon filter at the air intake to prevent these chemicals from entering the aquarium. Finally, the use of limewater in these situations can be an appropriate solution. Limewater may be especially effective in this situation because the tank would be less likely to experience the undesirably high pH that sometimes accompanies limewater use. While limewater is a common aquarium alkalinity supplement most potent at raising pH, other high pH additives would also suffice. Supplements based on carbonate, for example, would be very useful in this situation, while bicarbonate would not be. As a commercial example, the original B-ionic would be better than the newer version (Bicarbonate B-ionic). For home brews, washing soda (sodium carbonate) or baked baking soda would be better than normal baking soda (sodium bicarbonate). Low alkalinity can also lead to low pH. For example, if alkalinity is not supplemented as fast as it is removed by calcification, the pH will likely drop. This drop will occur with all alkalinity supplementation schemes, but will be most observable when using schemes that do not themselves raise pH (like CaCO3/CO2 reactors or bicarbonate). In this situation, the obvious solution is to somehow add more alkalinity (as shown in Figure 4). and drop. Soon, they may become convinced that the pH of 5 is going to kill the entire tank (it didn't in my case, but I don't recommend this process for general entertainment). A more likely scenario, however, involves some type of carbon dioxide accident that drives lots of CO2 into the tank from a malfunctioning reactor. In most of these cases, I'd advise doing nothing beyond substantial aeration to drive out the excess CO2. Maybe even open a window to ensure that the air being exchanged is not itself loaded with excess CO2. The tank should be back to normal in a day or so. If the aquarist did choose to add something to raise the pH, he would risk raising the pH too high in a day or so after the excess CO2 has blown off the tank. If a mineral acid were the cause of a pH drop (like hydrochloric acid), then the carbonate alkalinity (and the total alkalinity as well) will have crashed. I'd advise measuring the alkalinity and using a carbonate alkalinity supplement (not one containing large amounts of borate) to raise the alkalinity back to normal levels (say, 2.5 to 4 meq/L; 7-11 dKH). The end effect should be a rise in pH, though with some means of alkalinity supplementation (limewater or the original B-ionic) the pH rise will be fast, and with some schemes (such as baking soda) the pH increase will be slower, as the tank needs time to blow off the excess CO2 that results. If excessive vinegar or other organic acid were the cause of a pH drop, then I'd advise the same treatment as for the hydrochloric acid above, except that over time (hours to days) the acetate that resulted from the vinegar (acetic acid) will be oxidized to CO2 and OH-. The net effect is that the pH and measured alkalinity may rise. So in this case, err on the side of less alkalinity supplementation (maybe even none) because it will resolve itself before too long. If a large excess of alkalinity supplement is added to stabilize an accidental acid addition, the pH and/or alkalinity may later creep higher than desired. The pH of marine aquaria is an important parameter with which most aquarists are familiar. It has important effects on the health and well-being of the inhabitants of our systems, and we owe it to them to do the best we can to keep it in an acceptable range. This article provides a series of solutions to common low pH problems in aquaria, and should permit most aquarists to diagnose and solve the low pH problems that may arise in their own tanks. 1. Hydrogen-ion concentration of sea water in its biological relations. Atkins, W. R. G. J. Marine Biol. Assoc. (1922), 12 717-71. 2. Water quality requirements for first-feeding in marine fish larvae. II. pH, oxygen, and carbon dioxide. Brownell, Charles L. Dep. Zool., Univ. Cape Town, Rondebosch, S. Afr. J. Exp. Mar. Biol. Ecol. (1980), 44(2-3), 285-8. 3. Chondrus crispus (Gigartinaceae, Rhodophyta) tank cultivation: optimizing carbon input by a fixed pH and use of a salt water well. Braud, Jean-Paul; Amat, Mireille A. Sanofi Bio-Industries, Polder du Dain, Bouin, Fr. Hydrobiologia (1996), 326/327 335-340. 4. Physiological ecology of Gelidiella acerosa. Rao, P. Sreenivasa; Mehta, V. B. Dep. Biosci., Saurashtra Univ., Rajkot, India. J. Phycol. (1973), 9(3), 333-5. 5. Studies on marine biological filters. Model filters. Wickins, J. F. Fish. Exp. Stn., Minist. Agric. Fish. Food, Conwy/Gwynedd, UK. Water Res. (1983), 17(12), 1769-80. 6. Physiological characteristics of Mycosphaerella ascophylli, a fungal endophyte of the marine brown alga Ascophyllum nodosum. Fries, Nils. Inst. Physiol. Bot., Univ. Uppsala, Uppsala, Swed. Physiol. Plant. (1979), 45(1), 117-21. 7. pH dependent toxicity of five metals to three marine organisms. Ho, Kay T.; Kuhn, Anne; Pelletier, Marguerite C.; Hendricks, Tracey L.; Helmstetter, Andrea. National Health and Ecological Effects Research Laboratory, U.S. Environmental Protection Agency, Narragansett, RI, USA. Environmental Toxicology (1999), 14(2), 235-240. 8. Effects of lowered pH and elevated nitrate on coral calcification. Marubini, F.; Atkinson, M. J. Biosphere 2 Center, Columbia Univ., Oracle, AZ, USA. Mar. Ecol. : Prog. Ser. (1999), 188 117-121. 9. Effect of calcium carbonate saturation state on the calcification rate of an experimental coral reef. Langdon, Chris; Takahashi, Taro; Sweeney, Colm; Chipman, Dave; Goddard, John; Marubini, Francesca; Aceves, Heather; Barnett, Heidi; Atkinson, Marlin J. Lamont-Doherty Earth Observatory of Columbia University, Palisades, NY, USA. Global Biogeochem. Cycles (2000), 14(2), 639-654.